Today is graduation day, the day college students—so unlike my son will ever be—receive their diplomas after four years of ridiculously hard work at one of our nation's most prestigious institutions of higher learning. Bowdoin College, where my husband Michael most gratefully teaches photography, has turned out graduates like poet Henry Wadsworth Longfellow, writer Nathaniel Hawthorne, the founder of Netflix Reed Hastings, the late mayor of San Francisco Ed Lee, civil rights activist and Black Lives Matter supporter DeRay McKesson, and my dear friend and Olympic gold medalist, Joan Benoit Samuelson. Yesterday, graduating seniors and their families attended baccalaureate where their classmate, a student of Michael's named Diana Furukuma, was honored to speak of our need for cultural humility, of being open to engaging with others. She said, "At the core, cultural humility suggests that knowledge is about accepting how much we don't know. Locating the blind spots and implicit biases that we all have. It's about consistently asking, what am I not seeing?" Indeed, Michael sometimes gives his intro photos students an assignment where they take a photo, then turn around and take a photo of what is behind them to discover, perhaps with surprise, what they may not have been aware of in their deliberate search for something else. Graduation day is bittersweet for me. I love seeing the students dressed in their caps and flowing gowns. I relish—though while sometimes weeping—watching them walk past our home with their friends and family members on their way to the gathering. I kind of enjoy the pomp and circumstance, and if it weren't raining I'd take Calvin along as I have in past years. But I'm just not up for it this time, probably because Calvin and I are still recovering from him having had three grand mals within sixteen hours earlier this week, and so I'm loathe to bundle up, pack his food and drink and diapers, wrestle with a squirrely stroller and a broken umbrella, navigate the crowd, get wet. Last night, the three of us sat at the table as I fed Calvin some of his dinner. Michael remarked how strange and amazing it is that we have a fourteen-year-old child who doesn't speak, and that we can't really communicate with him—can never know his thoughts, desires and dreams. And while I wish for Calvin to have been born healthy, sometimes it seems as though he helps us find our blind spots, helps us see the world through different lenses. Perhaps he helps us delve more deeply into what other marginalized people experience—Black people, gay people, poor people, homeless people, immigrants, Muslims, Mexicans, etc—not that we didn't do so before, but perhaps our perspective and empathy are broader and deeper because of Calvin. So congratulations, graduates! May you forever see the world with new and curious eyes and from someone else's perspective. May you be open, challenge authority, question assumptions, be both introspective and outward-looking. Move forward. Evolve. Grow. 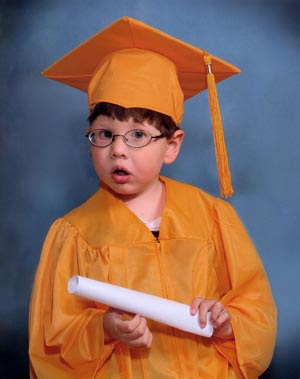 Calvin's preschool graduation, June 2010?